Banana Pudding Breakfast Jars are a no-cook, easy and quick meal that can be conveniently transported anywhere you go. It is like having a healthy dessert at breakfast time! They fit pretty much anyone’s lifestyle, especially those of us who are as busy as bumblebees. I know that many folks don’t have the luxury of sitting down and eating breakfast before heading off to work. Due to crazy traffic, many have to leave home earlier and earlier. 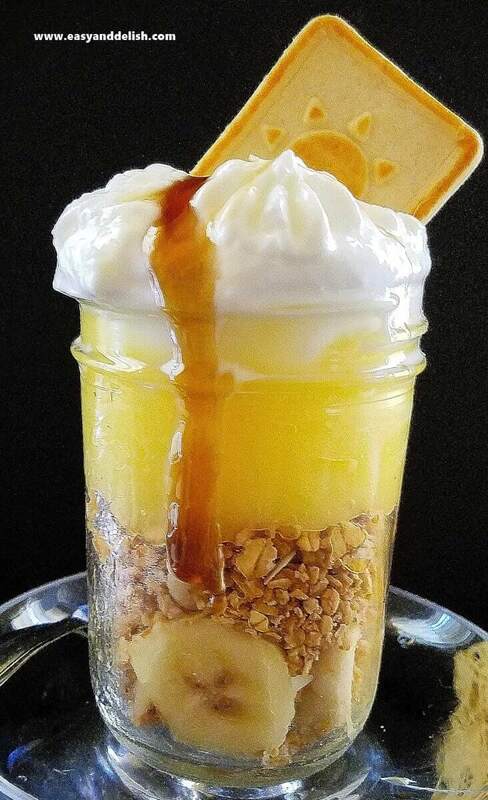 Our Banana Pudding Breakfast Jars make a complete meal stored in a mason jar that requires no cooking at all, and can be prepared the night before and refrigerated, making it easy to transport to work or any other place that you go. The only prep that one really has to do is to whisk the instant vanilla pudding mix with cold fat free milk for a couple of minutes and let it set for about 5 minutes. That’s all! Then, itsis just a matter of layering the rest of the ingredients — sliced bananas, granola, and yogurt. It couldn’t get any easier and quicker than this! Another advantage is that you will be taking with you just the right-sized portion, avoiding overeating and excessive breakfasting/snacking. These are as good as our Brazilian-style healthy breakfast on the go. 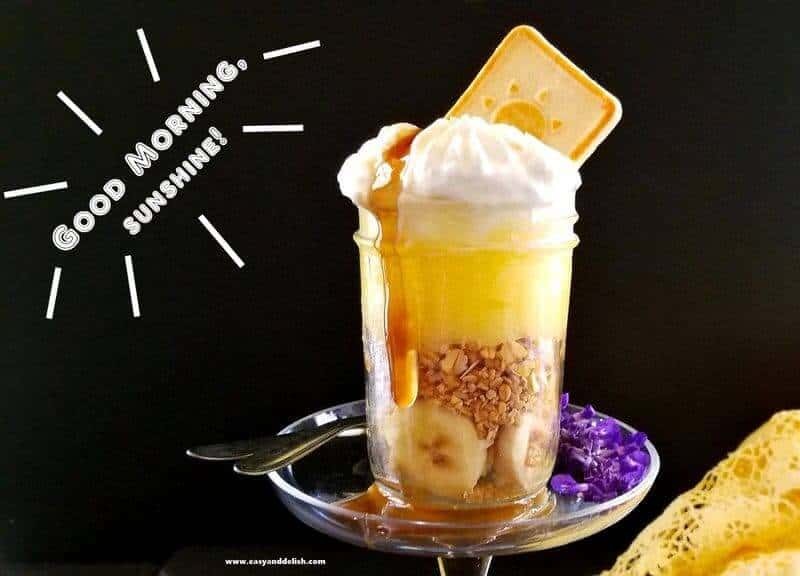 Banana Pudding Breakfast Jars are a no cook, easy and quick meal that can be conveniently transported anywhere you go. It is like having a healthy dessert at breakfast time! Place vanilla pudding mix into a large bowl. Whisk in cold milk for about 2 minutes or until obtaining a homogeneous mixture without lumps. Set aside. Place about 4-6 slices of banana in the bottom of each 8-oz mason jar. Add about 1/4 cup granola to each jar. Spoon about 4-6 Tablespoons prepared vanilla pudding into each jar and top with about 1/4 cup yogurt. Refrigerate for at least 30 minute or until chilled. These can be prepared ahead and refrigerated overnight. Enjoy! 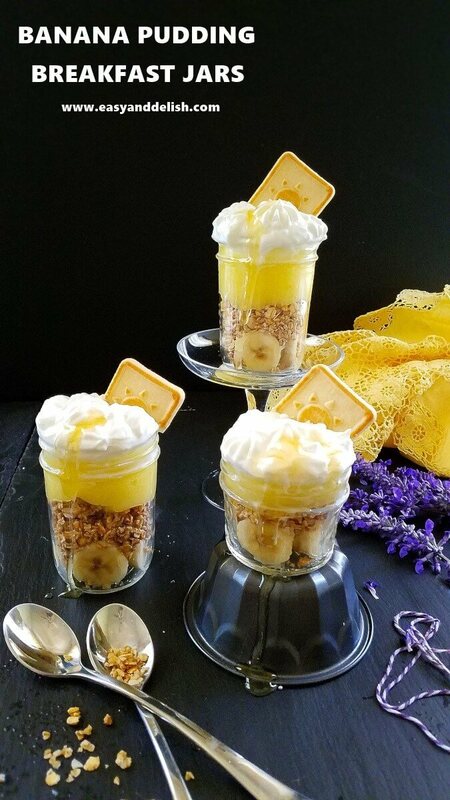 If desired, garnish banana pudding breakfast jars with Nila, Oatmeal, Biscoff, or Chessmen Butter Cookie and drizzle with honey or maple syrup. What a fantastic idea, Denise! 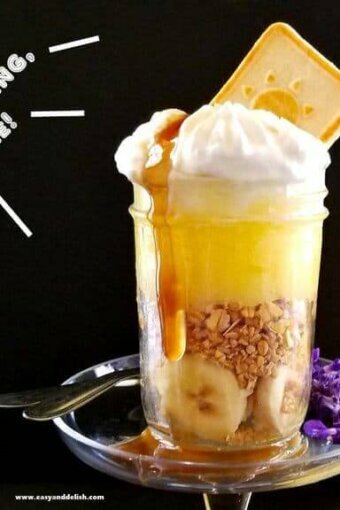 I love banana pudding, but never thought to enjoy it with four layers of sliced bananas, granola, instant vanilla pudding, and Greek vanilla yogurt – in a mason jar! Portable to take to work or even to enjoy on a picnic! Count me in! Make ahead breakfasts are just what I need during the week! I imagine other fruit would be scrumptious too. Love banana anything! And pudding tops the list. This looks terrific — great dish. Thanks! These look so good Denise…and what a treat right in the morning…I love all the layers that you have in these jars. YEASSSS…. 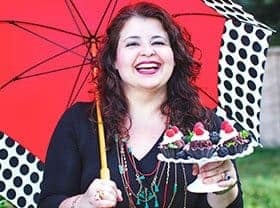 these look incredible Denise, I love food that looks and tastes amazing and can be transported conveniently too. Bananas are still a little expensive since the cyclone, but I could possibly substitute the banana for another fruit. Great idea, cant wait to try. Mmmm! OOOOHHHH Denise! You’ve done it again! These oats look perfectly amazing. Overnight oats are one of my favorite breakfasts (I have some in the fridge for tomorrow in fact) but I’ve never made them with pudding. Total genius. That’s all I can even say. Have a great weekend!